“We are extremely pleased to offer our high-performance EUROCOM Tornado F5 laptop to Canadians through BestBuy.ca. We have added two different configurations online so users can choose the best performance level for their needs,” says Mark Bialic, Eurocom President. The EUROCOM Tornado F5 supports NVIDIA GeForce graphics, an Intel Core i7 processor, and four memory slots in a 15.6” chassis for mind blowing performance in a highly mobile chassis. Being fully upgradeable the EUROCOM Tornado F5 can support a variety of MXM 3.0b graphics cards including next generation NVIDIA GeForce GTX 1070 and 1060 graphics. Utilizing an Intel Z170 Chipset and LGA1151 socket gives the EUROCOM Tornado F5 the ability to support the Intel Core i7 6000 series up to 6700K as well as the i7-7000 series up to 7700K processors managing up to 64 GB DDR4 memory. Four drives are supported for up to 6 TB of storage with two M.2 SSDs and one HDD/SSD. The internal components of the EUROCOM Tornado F5 are easily accessible to allow users the ability to upgrade chosen components to increase performance, capacity, and lifespan. The EUROCOM Tornado F5 is equipped to take full advantage of the desktop Intel processors and NVIDIA GeForce GTX 1070 or 1060 graphics due to their high-quality copper heatsinks, high-speed fans and use of Innovation Cooling Diamond 24 carat diamond thermal compound. Low temperatures in a laptop computer contribute to long-term stability. 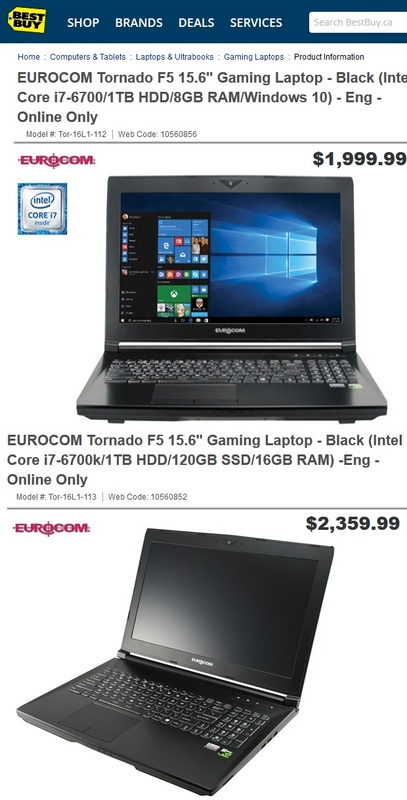 Prepare to be blown away by the EUROCOM Tornado F5. With its Intel i7 processor and 16GB RAM, the Tornado will help you blitz through daily tasks with ease. And when it's time to play, NVIDIA GeForce 1070 graphics with 8GB of memory renders visuals with silky smooth fluidity and sets you up for adventures in virtual reality. Get blown away by the EUROCOM Tornado F5. With its Intel i7 processor and 8GB RAM, the Tornado will help you blitz through daily tasks with ease. And when it's time to play, NVIDIA GeForce 1060 graphics with 6GB of memory renders visuals with silky smooth fluidity and sets you up for adventures in virtual reality. Eurocom is the leading developer of long lifespan, fully upgradable notebooks, as well as, high-performance mobile workstations and servers since 1989. Eurocom prides itself as an Industry leader in providing ground-breaking technology and continues to engineer innovative solutions that inspire individuals and companies to new growth and development. For more information on Eurocom, please visit us at www.eurocom.com .